Exploring, learning, doing: introducing the Leatherman Leap, the first Leatherman multi-tool created specifically for younger users. Our engineers designed the Leap with safety as our #1 priority. Exploring, learning, doing: introducing the Leatherman Leap, the first Leatherman multi-tool created specifically for younger users. Our engineers designed the Leap with safety as our #1 priority. That&apos;s why the Leap includes safety locks that keep fingers from the path of the tools, a two-hand opening knife blade for safer deployment, and a secure grip designed to train users to properly and safely operate tools. The Leap also comes with a user-installed knife blade that can be added by a parent when the user is ready for more responsibility. Here at Leatherman, we celebrate the mentors who took the time to pass on a valuable skill or life lesson. Together, we&apos;re helping adults pass on their tool skills and build a meaningful heritage with the next generation. For ages 9 and up. A thermoplastic material where strength is improved by adding chopped glass fibers. This allows for excellent durability without adding significant weight. 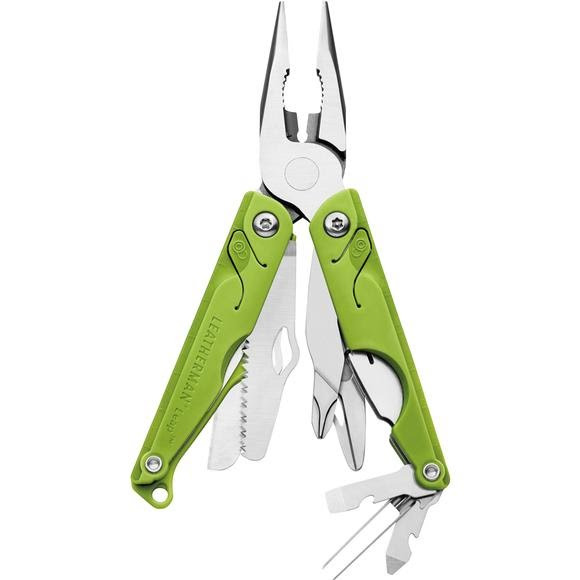 In Leatherman knives, the glass-filled nylon handles are so strong that an inner steel frame is not required, thereby reducing weight for a lighter every day carry. Dimensions Closed: 3.3", Blade length: 2.17"